Every day, customer interactions (B2B and B2C) generate massive amounts of unstructured text data all over the world: chats, emails, online mentions, customer support tickets, answers to open-ended survey questions, customer reviews. Volumes will grow even faster with increased usage of chat bots and Voice-to-Text. The Gavagai Explorer helps you perform advanced analysis, with automated thematic clustering and by scoring themes against multi-dimensional sentiments, to get indisputably robust, consistent, and valuable insights from text data, in more than 40 languages. The Gavagai Explorer allows you to perform instant qual-to-quant conversion and analysis of unstructured text data without any prior computer skills. The Gavagai Explorer lets you leverage new world-leading language AI to gain insights that were not previously possible. It lets you single-handedly process small or large amounts of qualitative data – at a lower cost and with higher quality output. 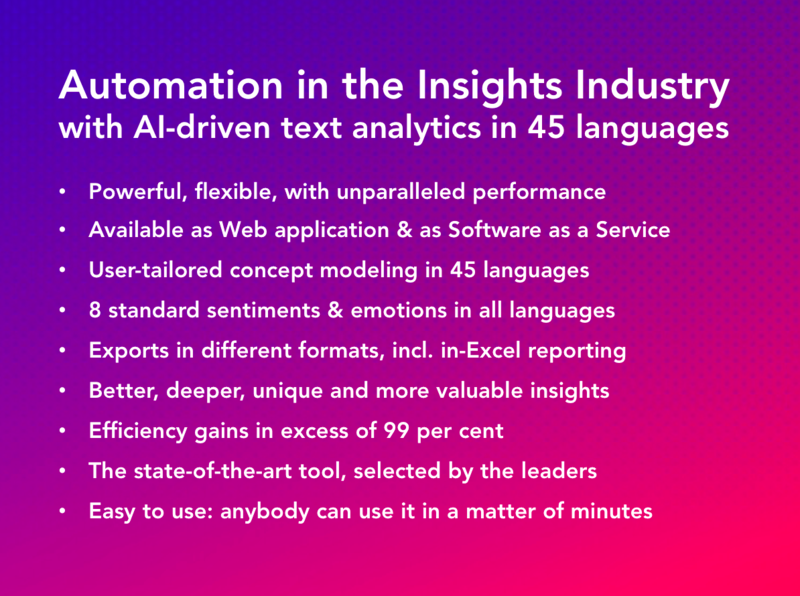 The Gavagai Explorer is the market’s most versatile text analytics solution – recently chosen by the global leaders in market research and analytics. Our clients see efficiency gains in excess of 99%. Read more about the Gavagai Explorer features right here. And try it for free right here. Watch this short video clip, which explains the basics.